Congratulations to all the lads for a winning season. Specially selected by Gaffer Gary. Warning - NOT to be drunk before matches. 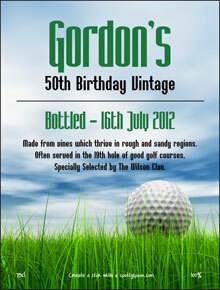 Looking for an unusual gift idea for an individual or team who has just won a sporting event. This victorious wine label has a cup or trophy winning theme. 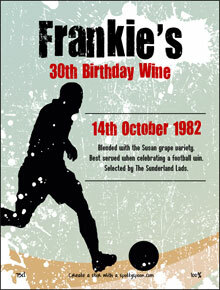 It shows a celebration with cheering crowds and someone holding up a cup and is ideal for whatever sport the champions have won, whether it is for football, rugby, tennis, golf, snooker, darts, motorsports, athletics or any sport it will make a great gift or can be used for drunken team celebrations. Simply add the details of the person or team, their sporting victory and download it for printing at home or let us print it for you onto our tough and easy to use peel and stick wine labels. 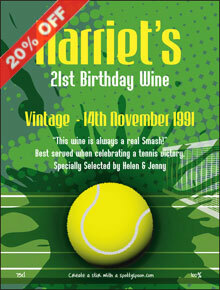 Its bright and colourful victory image on a personalised wine bottle will make the occasion even more special. Sports clubs - why not use them for an end of year celebrations of your sporting achievements. Note - good victory phrases for wine gifts and sport could be 'The choice of real winners', 'Always ahead of the field', 'The Title Winner's Vintage - Celtic 2012', 'A First Place Selection', 'Have a glass or two and then back to training', 'From The Grand Slam Season Selection' etc.